Collaborative methods of practice are increasingly the norm in contemporary art. Such works prioritize process over object production and technical proficiency, as well as social engagement and community over artistic autonomy. At the same time, the spheres of contemporary art and activism are increasingly intertwined. These developments have led to debates policing the traditional boundaries of art, as well as over the efficacy and potential of art as an instigator of change. Central to these deliberations is the work of Grant Kester, who publicly engaged in these discussions in responding to Claire Bishop’s widely cited Artforum piece “The Social Turn: Collaboration and Its Discontents” (2006). 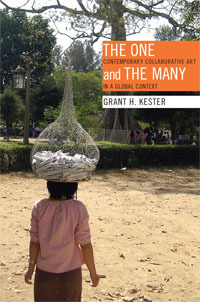 The One and the Many: Contemporary Collaborative Art in a Global Context will be of interest to those who followed Kester’s engagement with these debates, as he utilizes this volume to address critics and curators mapping collective art practices, including Bishop and Nicolas Bourriaud. Broadly, Kester positions collaborative practice in relation to the current period of neoliberalism and the avant-garde tradition in modern art. Identifying the recent growth of collaborative projects as a “global phenomenon” (1), Kester defines these practices as existing on a continuum that encompasses mainstream work in biennials and work that overlaps with the fields of development, urban planning and environmental activism. As such, the rise of collaborative practice evidences a “paradigm shift within the field of art, even as the nature of this shift involves an increasing permeability between ‘art’ and other zones of symbolic production” (7). Kester deconstructs this shift into two components: the move towards collective production and the organization of process-based art projects to allow for viewers’ participation. He explains that collective projects function to structure that experience, “setting it sufficiently apart from quotidian social interaction to encourage a degree of self-reflection, and calling attention to the exchange itself as creative praxis” (28). Kester’s aim is not to address all collaborative art, but rather to speak to the gap in theoretical discourse employed to discuss such projects. To this end, he draws on a variety of global case studies, ranging from contemporary artists and collectives operating within well-established international circuits, such as Francis Alÿs, Santiago Sierra, Thomas Hirschhorn and Superflex, to less well known collectives, including Park Fiction, Ala Pastica, Dialogue and Huit Facettes Interaction. Throughout, Kester makes use of compelling examples of artistic projects to prove his arguments, giving the reader a sense of the breadth of global artistic engagement in collaborative practice. The variety of projects he examines are further illuminated for the reader by the eight pages of colour plates in the volume and by black and white images embedded throughout the text. The introductory chapter establishes the ambivalent nature of collectivity, with Kester noting its potential to be coercive and oppressive, as well as to signify unanimity and solidarity. He positions questions of autonomy and unity, in particular, as central to understanding new modes of contemporary artistic practice. Early in this chapter, Kester includes the disclaimer that contemporary art projects cannot avoid complicity with hegemonic forces structuring the context in which they are created, setting up his subsequent arguments for a middle ground from which to understand the complex politics mobilized in different ways by different forms of collaborative artwork. Significantly, he differentiates the current dominance of collective practices since the 1990s as distinct from past methods of collaboration in art, linking the recent embrace of collective practice to the erosion of public resistance brought about by the spread of neoliberalism as the dominant global economic order. He also suggests that the emergence of collective practice is concurrent with the rise of biennials and a result of the encouragement of specific curators and critics. The first chapter, “Autonomy, Antagonism, and the Aesthetic,” examines collaborative projects by three collectives: Park Fiction, who engage creativity to address issues of redevelopment in urban spaces in Hamburg, Germany; Ala Plastica, who work to resist large-scale development by mobilizing local knowledge in the Rio de la Plata basin near Buenos Aires, Argentina; and Dialogue, who collaborate with Adavasi and peasant populations in the Bastar region of India, specifically engaging with women and children. Kester’s interest lies in how “the various social interactions that unfurl around a given project, rather than being ancillary to, or collapsed into, the a priori formal structure or design of a physical project…are openly and often independently thematized as a locus for aesthetic practice” (24). He notes the similarities between the three collectives in that they challenge artistic autonomy, a tenant of the modern avant-garde that presumes the artist, who provides critical insight, must be removed from society. Here, Kester traces recent critical scholarship on socially engaged art. He first analyses Bourriaud’s work on relational aesthetics, acknowledging the ubiquity of his framework, but critiquing his inability to account for the multifaceted nature and range of collective practice. Subsequently, he addresses Bishop’s writings, particularly her Artforum piece in which she dismisses activist art. Kester argues that the larger problem with Bourriaud and Bishop’s critiques is their location within the post-structuralist tradition, which has ties to early modern aesthetic philosophy. He points to the canonical status of theorists such as Foucault, Derrida, Deleuze and Rancière in the arts and humanities. Kester identifies a rapprochement between contemporary art and post-structuralist theory, a circular relationship with artists and critics relying on the same sources and set of concepts, and stresses that it functions as a significant impediment to fully understanding collaborative practice. He explains that the “distinct ‘post-structuralist’ strand within the larger field of critical theory has been so successfully assimilated that it’s now largely synonymous with critical theory per se” (54). To highlight this framework’s limitations, Kester outlines how it has historically contributed to the dominant narrative of the modern avant-garde. As such, he posits that current theory is unable to address collective practice, possessing an inability to work between oppositional categories. Kester investigates how collaborative art functions in the second chapter, “The Genius of the Place,” by focusing on ideas of labour and knowledge. He contends that new collective projects produce a different form of knowledge that is experiential; this form of knowledge is contingent on participants’ unique exchanges and cannot occur within a scripted event or predetermined object. Kester explains the approach necessary to produce such knowledge, stating, “The mode of perception…is not instrumental (site is not a resource for the enactment of an a priori vision or a goal already-in-mind), but rather, anticipatory and open” (152). He demonstrates that such an approach was missing in Alÿs’ 2002 work When Faith Moves Mountains. Faith was a performance at Ventanilla, outside of Lima, Peru, in which hundreds of volunteers were mobilized to engage in the futile activity of shifting a sand dune by shoveling. Kester critiques this piece, arguing that Alÿs marginalized the dialogical aspect of the work, did not engage in the specifics of its location, and foreclosed participants’ agency through the organization of the piece. Ultimately, he takes issue with Alÿs for reproducing the paradigm of the modern avant-garde. In contrast, Kester offers up several other collaborative projects that engage different global sites to successfully produce experiential knowledge. Concurrently, he argues that the discourse of international development, with its imposition of neoliberal ideology on the global south, is a pivotal context that must be taken into account in understanding collaborative practice. Here, he returns to Dialogue and details how they undertook their lengthy, complex projects to redesign water pumps (Nalpar) and to create new places for children to congregate and play (Pilla Gudi). He also describes the projects of the artistic collaborative Huit Facettes Interaction in Dakar, Sénégal, focusing on their project Atelier of Hamdallaye, in which they sought to resist the dominance of the global art world and reactivate cultural traditions by inviting artists and filmmakers to participate in a two week residency in the rural village of Hamdallaye Samba Mbaye in south Sénégal. In this residency, emphasis was placed on having the visiting artists and filmmakers respond to the cultural context of the region. Additionally, Kester delves into the work of Ala Plastica, emphasizing the fact that their projects are conceptualized and carried out without any preconceived outcomes. Instead, each project is open and experimental, but fully engaged in the context of its site. This same flexibility is highlighted in the projects of artists Jay Koh and Chu Yuan in Myanmar, who established an independent art centre NICA (Networking and Initiatives in Culture and the Arts) in Yangon in 2003. The analyses of these diverse global projects demonstrate the productivity possible when artists attend to site specificity and engage in prolonged collaborative projects. The final chapter, “Eminent Domain: Art and Urban Space,” focuses on two collaborative projects that address issues of class and race in resisting urban regeneration: Park Fiction and Project Row Houses in Houston, Texas. Kester details the activist roots of the Park Fiction collective in the Hafenstraße community, which in 1981 was involved in active occupation to claim space from the city and establish alternative institutional structures for its residents. Park Fiction emerged in 1994, galvanized by municipal efforts to build a high-rise office on a small piece of land that would have blocked the Hafenstraße community’s access to the waterfront. The project to create a park in its place was characterized by playfulness, as the collective employed creativity to solicit residents’ opinions on the structure of the park, which was ultimately a whimsical design featuring metal palm trees and flying carpets made out of grass, as well as a dog park with poodle-shaped hedges and gates. Kester emphasizes the complexity of understanding the resistance enacted by this project, as the collective worked within city development mechanisms, while also employing an alternative method of planning that prioritized community input. This is complicated by the nature of the finished park as a testament to the long sovereignty of the Hafenstraße community and a site for future alternative actions. As Kester notes, the project “proceeded neither through a direct, frontal confrontation with the state in the public space of the street, nor through full complicity with existing bureaucratic channels, but rather by working in the space between overt activism and formal state protocols” (205). Kester’s second case study in this chapter, Project Row Houses, similarly demonstrates the potential of negotiating complicity and resistance. Initiated by artist Rob Lowe in 1993, the project serves to promote and produce alternative methods of development in Houston’s Third Ward. It originated with Lowe’s purchase of twenty-two “shotgun” style homes originally marked for demolition. After studying the architecture of the houses and their history, which reflected diverse self-contained African American communities who espoused a tradition of mutual assistance, Lowe decided to refurbish them. Ultimately, the houses were transformed into affordable homes for single mothers and artists in residence, while maintaining their architectural integrity. In this way, Lowe has rewritten the traditional narrative of urban redevelopment by locating the shotgun houses as a focal point of the Third Ward, an element to be celebrated and linked to cultural traditions in the face of processes that seek to remove poor and working-class residents. Again, Kester notes the conflicted nature of Project Row Houses’ ongoing resistance. For example, it inadvertently encouraged gentrification, but concurrently was able to challenge and contest the goals of urban redevelopment in a sustained manner. Kester dwells on these larger questions of the efficacy of artistic critique in concluding his analysis of both projects. He emphasizes the potential of such work to disrupt neoliberal capitalism by engaging it creatively, rather than attempting to dislocate it in one revolutionary moment. Suggesting that resistance can be fostered by engagement in individual actions, he maintains that there is “much to be learned from the ways in which people respond to, and resolve, the struggles they confront in everyday life” (226). In The One and The Many, Kester makes a significant contribution towards providing an innovative and comprehensive understanding of the role of art in political struggle, namely how collaborative projects can enact resistance by “working in the space between” (205) to result in concrete and sustained change. By providing new methods of analysis, he advocates for a move beyond the dualities that have clouded art criticism. As he explains, thorough evaluation of collaborative art “can reveal a more complex model of social change and identity, one in which the binary oppositions of divided vs. coherent subjectivity, desiring singularly vs. totalizing collective, liberating distanciation vs. stultifying interdependence, are challenged and complicated” (89). More importantly, Kester reveals the necessity of thinking through naturalized theoretical frameworks for understanding art’s role in society, as well as the labour of both artist and viewer. Tackling some of the most hotly debated subjects in art and criticism today, The One and the Many represents a decisive intervention into what we can expect to be a much longer discussion about the nature of collaboration in contemporary art. Sarah E.K. Smith is a PhD Candidate in the Department of Art at Queen’s University. Her research scope is modern and contemporary visual and material culture, with specific interest in the relationship between culture, economics and globalization. Smith’s dissertation examines the response of artists, curators and museums to the implementation of the North American Free Trade agreement in 1994. Smith is also the founding Co-Editor of the online journal Shift: Graduate Journal of Visual and Material Culture.